Graduates from the National University of Singapore (NUS) are among the most employable in the world, a global survey of recruiters published today has confirmed. NUS has jumped six spots to be placed 10th in the latest Global University Employability Ranking compiled annually by French human resource consultancy Emerging and published by Times Higher Education (THE). 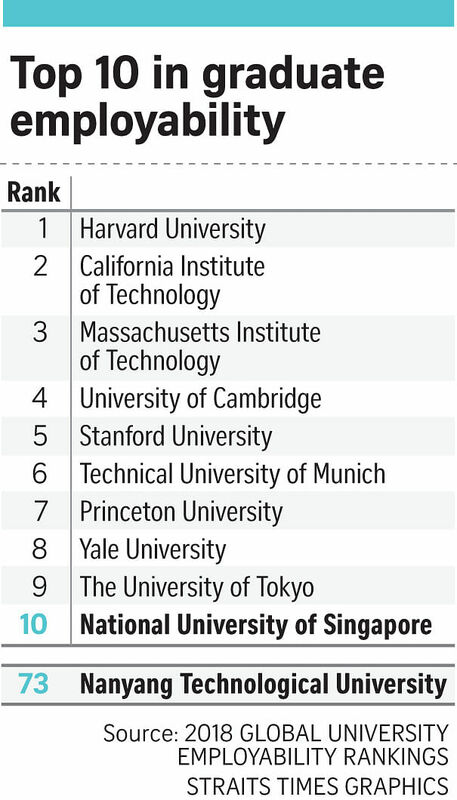 It is the only Singapore university in the global top 10, and one of Asia's top two universities for employment. Nanyang Technological University (NTU) advanced from the 91st to 73rd ranking on the list. Harvard University was placed first, followed by the California Institute of Technology, the Massachusetts Institute of Technology, the University of Cambridge and Stanford University. Now in its eighth year, the Global University Employability Ranking measures how sought after a university's graduates are in the job market. The annual global survey was conducted with 7,000 recruiters and managing directors of international companies from 22 countries who cast around 75,000 votes for universities they felt were the best for graduate employability. Together they represent employers that have recruited more than 250,000 young graduates in the past 12 months. Mr Simon Baker, THE Data Editor, said although Singapore may have "a small footprint" in the employability ranking, with just two entries, it is "an increasingly deep footprint", with one institution now in the top 10 and the other inside the top 80. Within the top 150, University Malaya from Malaysia is also included and ranked 149.